For students: We hope this guide will help sharpen your reading skills and deepen your understanding of this issue’s articles. For teachers: We encourage reproduction and adaptation of these ideas, freely and without further permission from AramcoWorld, by teachers at any level, whether working in a classroom or through home study. As the Classroom Guide moves digital, we have adopted the format introduced in March/April 2015: Each lesson is based on one article. The lessons include an introduction, a statement of goals—what students should be able to do by the time they finish—and step-by-step instructions for the activities. Each lesson also includes a link to Common Core standards that the lesson meets. We hope this format will make it easier than ever to use AramcoWorld in your classroom. Let us know! Send me your comments. Take a few minutes to look at the photograph for "FirstLook: Learning from the Pattern-Masters." What are your first impressions? What do you think about when you see the photo? How do you feel when you look at it? For example, the photo might spark your curiosity, making you wonder where it was taken and what place it shows. Maybe it makes you think about the time you visited a very crowded city, and it reminds you how you felt when you were there. Maybe the photo makes you sad because the shades of blue remind you of the short days of winter, or peaceful because it feels like either dawn or twilight. You get the idea. Write your first impressions—thoughts and feelings—in a journal entry. Conclude your writing with any questions that the photo raises for you. If you’d like, discuss your impressions and questions with one of your classmates. Everyone looks at visual images in their own way. Many people say they notice the subject matter first. (“This is a picture of a city.”) But others might notice the color first (“This photo with beautiful shades of blue”), or the shapes (“The photo includes lots of squares and arcs”). There’s no right or wrong way to look at an image, but it’s useful to learn about your own process of looking. Now that you’ve got a few first impressions of the photo, look at it more closely. What was the first thing you noticed about it? Where did you look next? What about after that? Did you want to look at the photo more closely? If so, what was it about the picture that drew you in? Or were you not drawn in? If you weren’t doing this activity, would you have been more inclined just to flip (or click) past it? If so, why? There are different ways to analyze a photo. One way is to think about the subject matter. (Hint: The caption tells you.) Go online and do a little reading about this location. Based on what you read online and on the caption in AramcoWorld, why do you think the photographer, Richard Doughty, might have been interested in taking pictures of this scene? What is it about the subject matter that might make it interesting to someone? Now try thinking about the photograph in another way. Think about its composition, which is different from the subject. The composition of the photo refers to how it is arranged within the frame. Maybe you think that a photographer can’t control that when he’s taking a picture like this. After all, it’s a city, not a bowl of fruit that he could pick up and move to a different location so that the light would hit it differently. 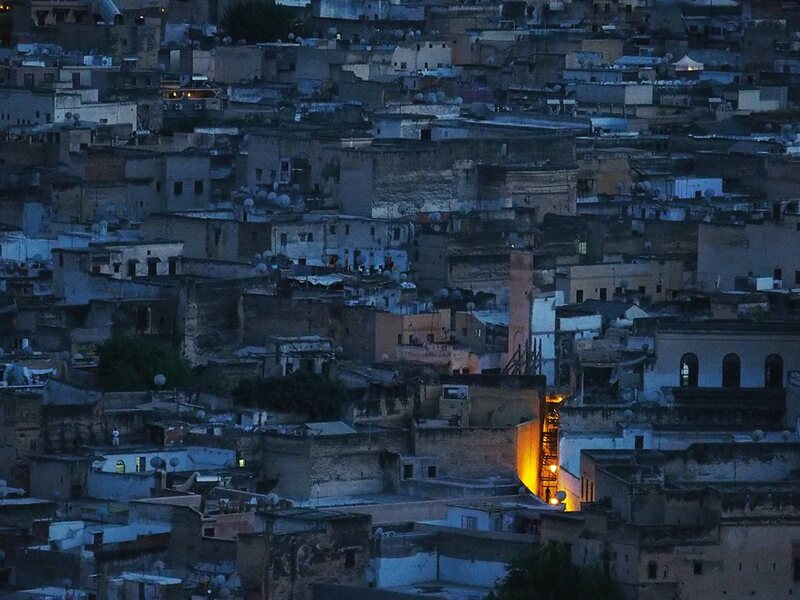 But photographers make many decisions about how to photograph even places as big and unmovable as the madinah in Fez. He can decide what time of day to take the picture, where to stand, how much of the city to include in the frame, whether to zero in on one spot for a close-up, and so on. This means including some things and excluding others: It’s a process of selection. He can also make further selections by editing the picture once it’s taken: crop, change tones, and so on. To help you think about the photographer’s decisions, look at other photos of the same place. Do a search for images of Fez’s madinah. Choose one photo to compare to Doughty’s. Working on your own or with a partner or small group, make a T chart. In one column, list the ways that the two photos are similar. In the other column, list the ways they are different. When you’re done, use the information in your chart to answer this question: What decisions did Doughty make that make his photo different from the other one you looked at? For example, he photographed in the evening rather than in full daylight. What effects did that decision have? What effects do the elements of the photo have on you as a viewer? What do you like best about the picture? Why? Now that you’ve looked at the photo more closely, return to your first impressions of it. Can you identify what it is about the photo that led you to think and feel certain ways when you first looked at it? “Capturing the Light of the Nile” includes the following quote: “No matter how accurate, paintings, drawings, and prints are always acknowledged as interpretations shaped by the artist’s hand and eye. A photograph, on the other hand, was initially thought to offer a direct, unmediated slice of reality.” You’ve done some significant analysis of a photograph of Fez. Based on the work you’ve done, write an essay that answers this Big Question: Is a photograph an accurate reproduction of reality? Use the FirstLook photo, and your analysis of it, to provide evidence for your answer. Divide the class into groups and assign each group one of the stories in “Stories My Father Told Me,” and the painting that accompanies the story. Read your assigned story, and look at the painting. With your group, discuss this question: How is the image in the painting connected to the story? For example, is the painting a more or less literal translation—from words to images—of the story? Or perhaps the painting represents one element of the story. Or is it abstract images based on the story? Or a combination? Once you’ve decided how the painting and story are related, discuss with your group what you like about the painting, both as a work of art and as it relates to the story. If there are things you don’t like about the painting, discuss those, too. Then bring the whole class together and have each group share its story and painting, the relationship it sees between them, and group members’ thoughts about them. 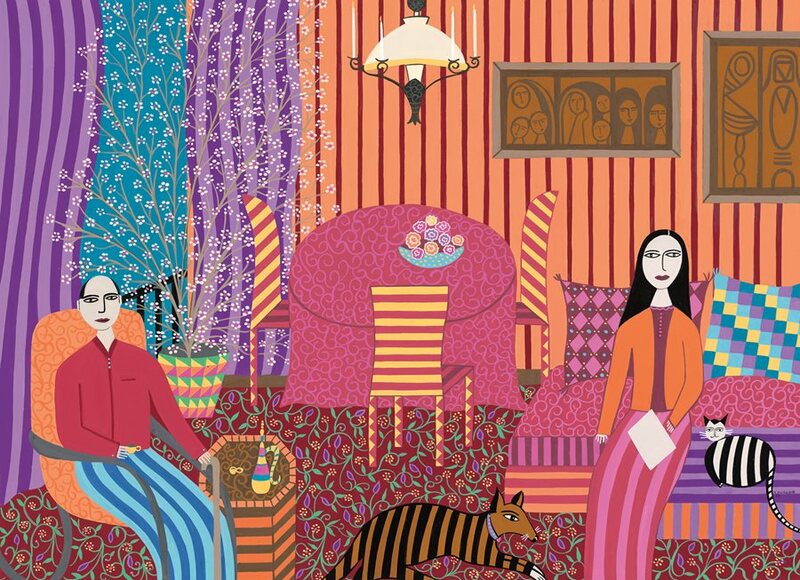 At the beginning of “Stories My Father Told Me,” Helen Zughaib explains how the series of stories and paintings came about. Reread that part. Then try it yourself. You may ask an elder (a parent, grandparent, teacher, or friend) to tell you a story about his or her youth, similar to the stories that Elia told his daughter. Of, if you prefer, you can write your own story. The story should be brief, like Elia’s. Then create a visual image to go with your story. You may want to make a painting, as Helen has done, or you might prefer to make a collage, a sketch, or even a photograph. When you’re done, write a few sentences that explain the relationship between the story and the art work, using your group’s discussion to guide your thinking. When you’re done, revisit Zughaib’s paintings and stories, and your evaluation of them. Has your thinking about them changed since you’ve made your own stories? If so, how? 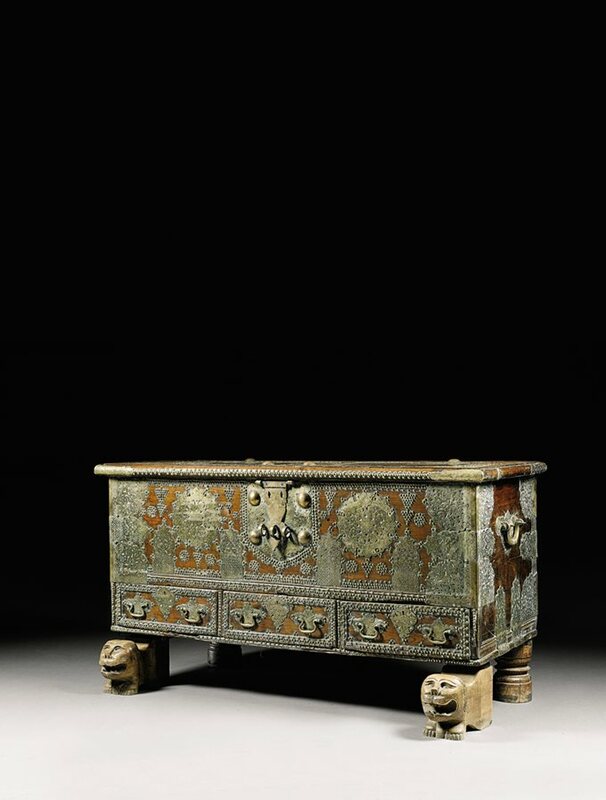 Look at the photo of a dowry box above, from the article "The Art of the Dowry Chest." The box is at the center of the frame, set up at an angle to the viewer. The photographer had to make a decision about how to place the object and from what vantage point to photograph it. Such decisions affect both how the final picture looks and how it affects the viewer. See for yourself. Chose an object to photograph. Using your phone or a camera (or lacking those, make a “frame” with your fingers) take pictures of the object from different angles and in different places in the frame. Discuss with a partner or the class how the shots differed from each other and how that affected you as a viewer.